This photo was taken at 1:12 PM on October 18, 2017. The "Take It!" came as I was trying out a new "square" format in my camera. My trial photos took me to the back yard, and a location which we have visited before. This time there were fall leaves on the ground and the sun was casting its handwriting on the wall. All of this was letting the bottom step know fall is on the way. The After Take: I am a bit rusty with the transition from being the reluctant patient (and who isn't?) to back into getting about and having the available space, to begin to see things outside of the usual way. Here is hoping fall is easing its way into where ever you may be, and like it is here, allowing for us to enjoy its arrival. Before they fall, the leaves are giving their annual color show. Sending you all, my very best regards. 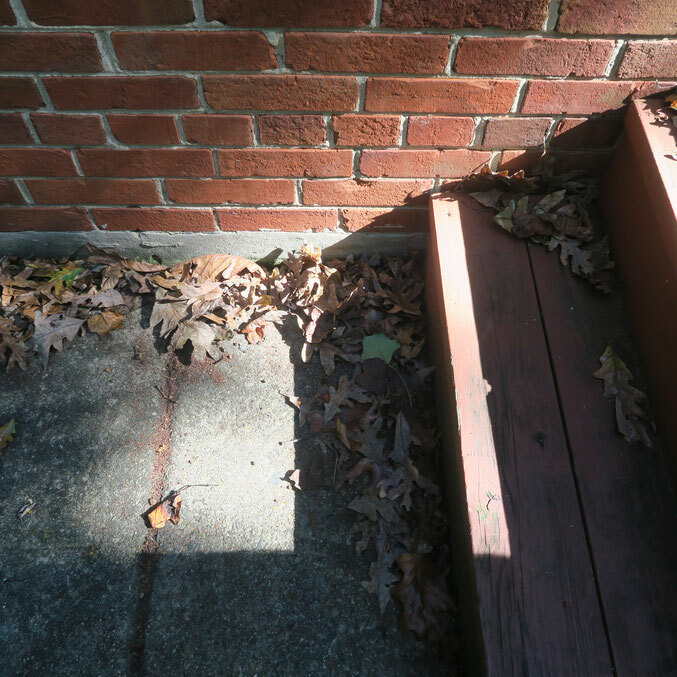 PS A second look at the photo shows the luck in the catch, of the sun being masked by its angle in the sky to produce light on the front edge of each step, almost as if, it had been carefully painted there. Oh I absolutely love Autumn. Its such a beautiful time of year. You certainly don't seem rusty, great photo! I loved the Fall until I moved somewhere the leaves actually fell. Endless days of raking leaves into a huge pile only to have one of my kids decide to canon ball into them. I just moved about 6 months ago, my new town completely skipped Fall and went right to Winter. Its already 30 degrees and snowing here. How has fall been in Maryland? Leaves turning yet? I would love to experience that area, maybe Vermont, in the fall. Pictures always look so beautiful. It was 99 here yesterday lol. Still summer. do those lead to a basement? do they have basements where you live? ive always wanted one but they dont really build them in Oregon.